Our next section in the gospel of Matthew gives us three stories about someone(s) being healed from either a disease or a person being brought back to life. 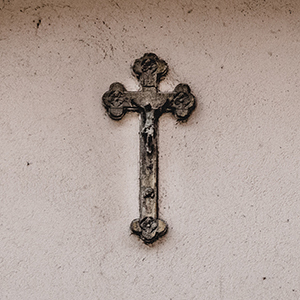 The first story is of a daughter of a synagogue leader who has a daughter who has “just died.” The man approaches Jesus with the proclamation that if Jesus would simply lay his hand on this daughter, she would be brought back to life. We know very little about this specific Jewish leader. However, most of the synagogue leaders would not have thought Jesus an acceptable teacher of the law (he was uneducated in the law and grew up the son of a carpenter) nor an individual one would go to in order to try to receive healing for a family member. Most Jewish leaders opposed Jesus, yet here is this man making a simple statement of faith: You can bring her back to life. The second story is placed within the middle of the first, the incident happening while Jesus’ was on his way to the Jewish leader’s house. A woman who had been bleeding for twelve years comes up behind Jesus and touches the fringe of his robe, just the outer edge of his garment. The response is twofold. The woman was healed, and Jesus turns to the woman to tell her: your faith has healed you. It was a bold move by this woman to reach out and touch Jesus. What if nothing happened? How awkward would it have been for Jesus to turn around and ask: Did you need something? Yet, as Jesus points out, this woman had faith that healing could come from him. The last story is of two men, both blind, who literally follow Jesus into the home where he is staying. (Speaking of boldness, right?) Jesus asks the two: Do you believe that I can make you see? Yes, they reply, we do. And because of their faith, we are told, Jesus heals them. It is fairly easy to see a common thread running through these stories: the faith of the individual seeking healing. Yet in spite of the clear example in each of the stories, putting that faith into action in our own lives can be much more difficult. Our faith in God is always filtered through the lens of our own experiences and our (limited) understanding of what is and is not “humanly” possible. The harder challenge is to look through the eyes of God, allowing his boundaries to define what can be accomplished. As Ephesians 3.20-21 says, the one who is able to do more than we can imagine is faithful to us, he will do those amazing things. Will we be faithful to him and trust that is true? God’s appearance in a dream to Jacob serves as an “introduction” of sorts of God to Jacob. How were you introduced to God? What sort of events precipitated your knowledge of him? How has he continued to demonstrate to you his working in your life? Join with Jesus and Matthew’s readers this week in praying for workers who will work the harvest, that is, individuals who will share the stories of Jesus’ compassion on people who need to hear a word of good news. Can we join with the psalmist is saying we trust in the Lord for protection? Do our efforts to always prepare for the worst demonstrate a lack of trust in God for protection? Why or why not? Most of us despise discipline and correction. How can we view these things as benefits from God who loves us, rather than something negative to be avoided?